Can I Receive A Email Proof BEFORE Printing? Yes. You will receive a proof by email prior to production. You can review all artwork and copy for accuracy. Note: There is a required field in the Order Form for you to provide the email address we will send the proof to. I Need More Than 2500, What Do I Do? We do offer larger quantities. Call us so we can discuss your exact needs. Do I have any Paper Stock Options? Yes. 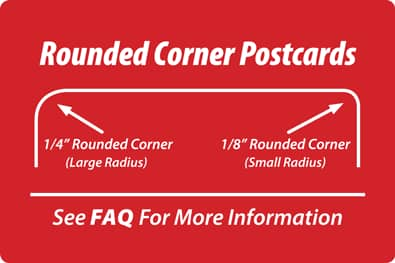 All 4x6 Postcards are printed on thick, 16 Point C2S (coated front and back). UV coating is applied to front and adds a glossy finish. We offer a wide range of thicknesses and finishes. Your options are listed below. 18 Point C1S (coated on front with a matte finish on back) UV Coating is applied to full color front. See product details for pricing information. 14 Point Matte (White) - Has a uncoated, matte finish on both the front and back of your business cards. After we add your company logo to our system we can use it on any of our card designs. There may be additional fees associated with adding your logo to our system. If your logo needs to be rebuilt, or altered to work with a card design you have chosen our Art Department will contact you to review your options. Please Note: The better the artwork, the better the reproduction. If you provide a low quality, low resolution jpg or gif, the printed product may appear blurry with jagged edges. Your question not answered above? Here is a list of logos we can add to cards at no additional cost. Use the Additional Information Text Box of your Order Form to let us know which logo(s) you need. 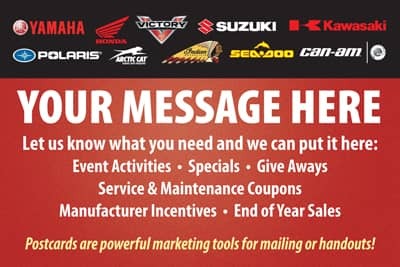 If you don't see a logo you need let us know and we will see what we can do. Use the Additional Information Text Box of your Order Form to let us know which logo(s) you need. If you don't see a logo you need let us know and we will see what we can do. In the Order Form, indicate the layout you want printed. Selecting a layout that is shown in color will be printed in black/white unless the Print in Color option is selected. 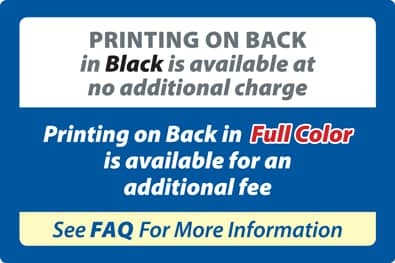 Describe the copy, and layout you need for the Printing on Back section of the Order Form. We will contact you if we have any questions. A proof can be sent by email for your to review and approve before production begins.